An unaltered photocopy of your DD-214 displaying your unit's award of the MUA. Awarded to USAF Active Duty, AFRes, and ANG units for exceptionally meritorious conduct in the performance of outstanding achievement or service ind irect support of combat operations for at least 90 continuous days during the period of military operations against an armed enemy of the US on or after 11 September 2001. The unit must display such outstanding devotion and superior performance of exceptionally difficult tasks as to set it apart and above other units with similar missions. 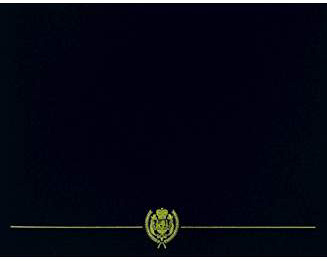 The degree of achievement required is the same as that which would warrant award of the Legion of Merit. Service in a combat zone is not required, but service must be directly related to the combat effort. Squadrons, groups and wings may be recommended for this award. The MUA cannont be awarded to any unit/unit component previously awarded the AFOUA, AFOEA or unit award from other service components for the same act, achievement or service. Approval authority for the MUA will be MAJCOM Commanders, however, approval is delegated in cases when NAF commanders are serving as Air Component Commanders (i.e. USCENTAF/CC). Award criteria for annual awards will be disseminated from MAJCOMs and air component commands. Devices associated with award of the Meritorious Unit Award are Oak Leaf Clusters used to denote multiple awards. The Air Force Meritorious Unit Award was established by Secretary of the Air Force James G. Roche. The Air Force Meritorious Unit Award has been in effect since September 11, 2001. The Air Force Meritorious Unit Award is awarded to active duty, Guard, and Reserve units for exceptionally meritorious conduct in the performance of outstanding services for at least 90 continuous days during military operations against an armed enemy. The unit must display such outstanding devotion to duty and superior performance of exceptionally difficult tasks as to set it apart and above other units with similar missions. The degree of achievement required is the same as that which would warrant award of the Legion of Merit to an individual. Service in a combat zone is not required, but the service rendered must be directly related to combat effort. Squadrons, Groups and Wings may submit for this award. Superior performance of normal duties will not alone justify this award. 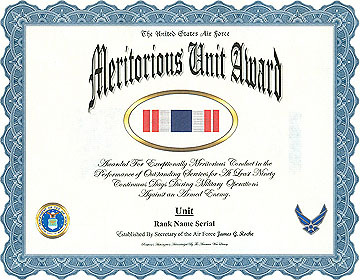 The Air Force Meritorious Unit Award is worn after the Air Force Gallant Unit Citation and before the Air Force Outstanding Unit Award.